Want a long, flat run with great water views? 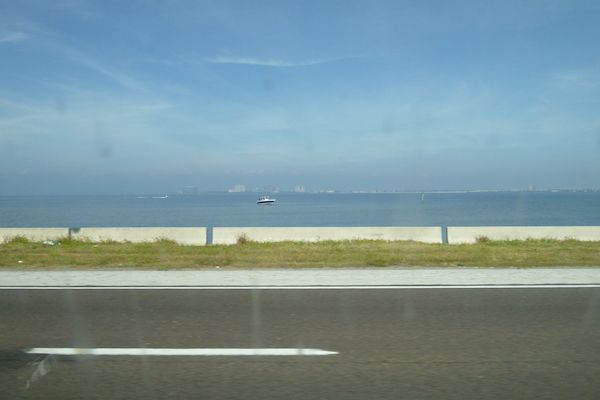 Practically connecting two airports and Tampa with St. Petersburg and Clearwater, the Courtney Campbell Causeway runs for 8.5 miles from Ben T. Davis Beach to the other end of the bridge in Clearwater. There is a separate pedestrian path, well away from cars rather than next to them, making this a great, seamless run with water views the whole way. Since it’s 8.5 miles one-way, you’ll have to choose your distance. And, there is a 45′-high bridge with panoramic views of Tampa Bay…and one of the few opportunities to a ‘hill’ in Florida! Add-On: Bayshore Blvd. in the Clearwater side has a path that’s very pleasant for running. You can run south, or north up to Safety Harbor, which has a lovely main street. Water views a good part of the way. Tampa End: Near Rocky Point/Ben T. Davis Beach; St. Pete/Clearwater End: S. Bayshore Blvd.